There are five hotels near the Hatch Shell in Boston. The Taj Boston Hotel, Boston Park Plaza Hotel & Towers, and the Four Seasons Hotel are located on the Arlington Street side of the Hatch Shell. The Liberty Hotel and Holiday Inn Boston at Beacon Hill are located on Cambridge Street side. Access to the Esplanade Park and Hatch Shell are via two footbridges that cross over Storrow Drive. The hotels rate from three to five stars, and are within walking distance to Shell. 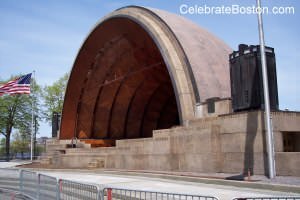 The Hatch Shell is a popular venue during spring and summer for FREE concerts and movies, as well as other events. The Shell is located in a park known as the Esplanade, a narrow greenway along the south embankment of the Charles River. The main access to the Hatch Shell is via the Arthur Fiedler Footbridge at the north end of Arlington Street. Access from the east is at the footbridge located near Charles and Cambridge Streets. The walking distance from Charles Street to the Hatch Shell is about the equivalent four blocks, and is generally less crowded from this direction during events. Besides free concerts such as the Radio 929 EarthFest, July 4th Pops Spectacular, WODS and Landmarks Orchestra music series, there are also several other events held at the Hatch Shell each year including the Aids Walk and Run, NSTAR Walk for Children's Hospital, Making Strides Against Breast Cancer Walk, and Juvenile Diabetes Walk. Also noteworthy is the Free Friday Flicks open-air movie series that has taken place for many years at the Shell. The area in front of the Hatch Shell is simply known as "The Lawn," and during the July 4th Celebration is referred to as "The Oval." Closest to the Hatch Shell Lawn is the Taj Boston Hotel, located at Arlington and Newbury Streets. To get to the Hatch Shell, just walk north up Arlington Street to the end, cross Beacon Street, and then the bright orange Arthur Fiedler Footbridge is visible just around the corner. There is a great deal of vehicular traffic at this intersection, as it is a major access road to Storrow Drive. Walk over the footbridge, and the Hatch Shell is visible on the right. Taj Boston is a four-star Luxury Hotel with a great location. One can shop along Newbury Street, or just cross Arlington Street to get to the Public Garden. 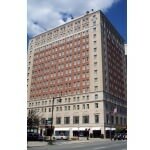 Also located on Arlington Street is the Park Plaza Hotel, which occupies the center of Park Square. Just walk north up Arlington Street to the Fiedler Footbridge, cross over Storrow Drive, and the Hatch Shell is on the right. It's about a 15 minute walk to the Esplanade. The Theater District is a few blocks south of The Park Plaza, with Boston's Back Bay District just west on Boylston Street. Arlington Station on the MBTA Green Line is only one block away from the hotel up Boylston Street. The Four Seasons Hotel Boston is located on Boylston Street opposite the Public Garden. To get to the Hatch Shell, walk one block west to Arlington Street, then north to the end and cross over the Fiedler Footbridge. The Four Seasons is a Luxury Hotel, with the north facing rooms overlooking the Public Garden, which is very beautiful in Spring when the trees are blossoming, or during Autumn when the leaves are changing color. The Theater District is just east of the hotel, with downtown Boston being a short cab or subway ride away. The other main access way to the Hatch Shell is located to east at Charles and Cambridge Streets. There is a "rotary" or traffic circle under the MBTA Red Line station at this major intersection. The footbridge to the Esplanade is situated at the end of Charles Street. There is a lot of vehicular traffic at Charles Circle because of Storrow Drive access ramps, and also over the Longfellow Bridge to Cambridge, a main thoroughfare over the Charles River. The Liberty Hotel is located on the opposite side of the traffic circle from the footbridge. This hotel probably has the shortest walk to the Hatch Shell. One must cross Cambridge Street and then Charles Street to reach the footbridge. After crossing the footbridge to the Esplanade, walk west to the Hatch Shell. It's the equivalent of about four long blocks. Fewer people walk to the Hatch Shell from Charles Street, so the queue is shorter when accessing the footbridge during events. On July 4th, many people observe the fireworks from Longfellow Bridge, which is closed to vehicular traffic after about 3 pm. Liberty Hotel is literally yards away from Longfellow Bridge if one plans to see the fireworks and have access to a nearby hotel room. The world-renowned Massachusetts General Hospital is located just behind the hotel. Government Center and Faneuil Hall Marketplace are about a half-mile away up Cambridge Street. Noteworthy is that the west wing of the hotel was once part of the old Suffolk County Jail, and has a beautiful granite facade with ornate cupola on top of it. The Holiday Inn Beacon Hill Hotel is three blocks south at Cambridge and Blossom Streets. It is one of the few budget hotel choices in downtown Boston. To get to the Hatch Shell, cross Cambridge Street, and then cross Charles Street over to the footbridge. The Holiday Inn is also very close to Mass General Hospital, with Government Center and Downtown Boston just up Cambridge Street. Area: Boston Common, Map Pin "A"
Area: Boston Common, Map Pin "B"
Area: Boston Common, Map Pin "C"
AArea: West End, Map Pin "D"
AArea: West End, Map Pin "E"